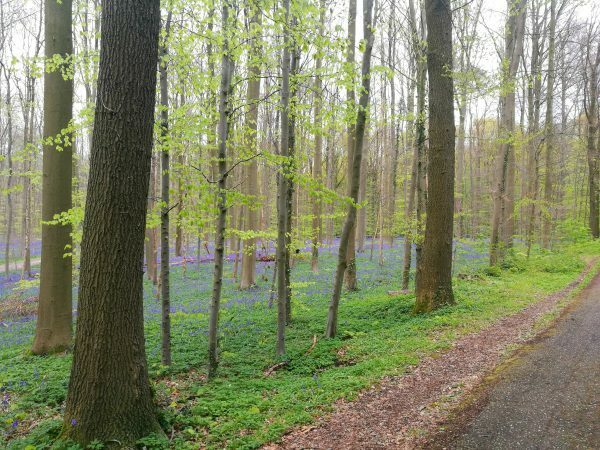 Not long ago I was scrolling through Pinterest and found myself on a page featuring some truly breathtaking photography of a fairy-tale like forest with a carpet of purple-blue flowers. 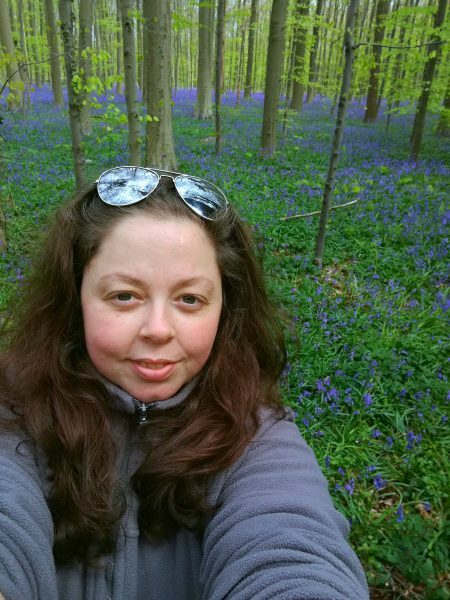 After discovering that these images were taken at a forest called Hallerbos in Belgium I did some more research and discovered it was only two and a half hours drive from where we live in the Netherlands! 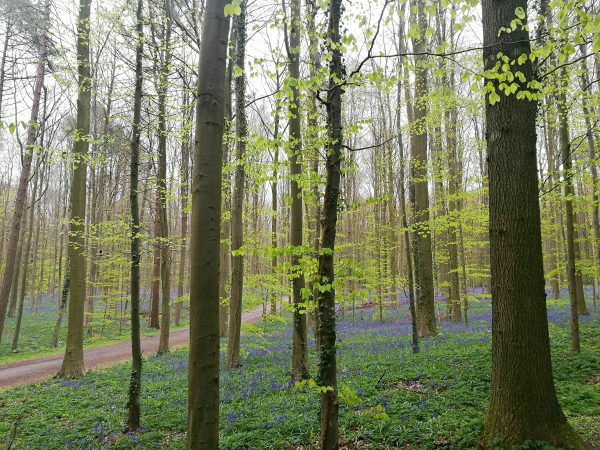 After more careful research and planning Dennis and I visited the magical forest of Hallerbos about two weeks ago, and now I am going to share with you exactly how you can also visit this amazing destination with all the details on when, where and how to get to Hallerbos! 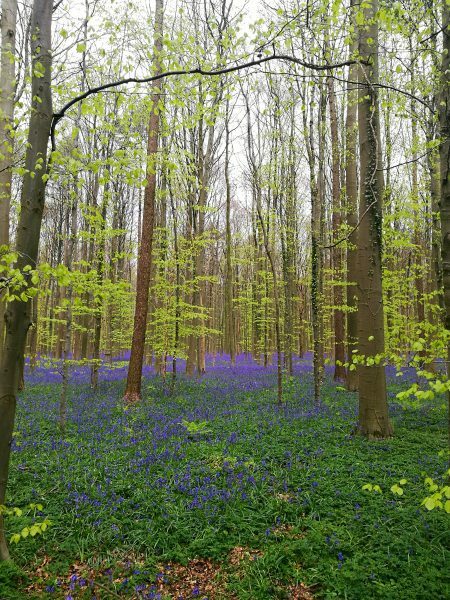 You can visit Hallerbos year-round, but if you want to see it when the bluebells are in flower (the bluebells flowering are what gives it the magical purple-blue carpet) then you will need to time your visit very carefully. The phenomenon that creates this fairy-tale like scene (as seen in the original article and the photos I took) only occurs for a couple of weeks a year, and can’t be predicted with absolute accuracy. 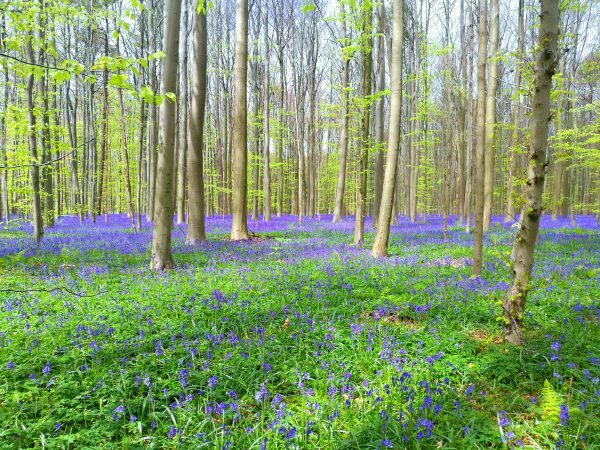 It will always happen in Spring but depending on how warm or cold the winter and beginning of Spring has been then the bluebells coming into bloom might occur at any time during April. 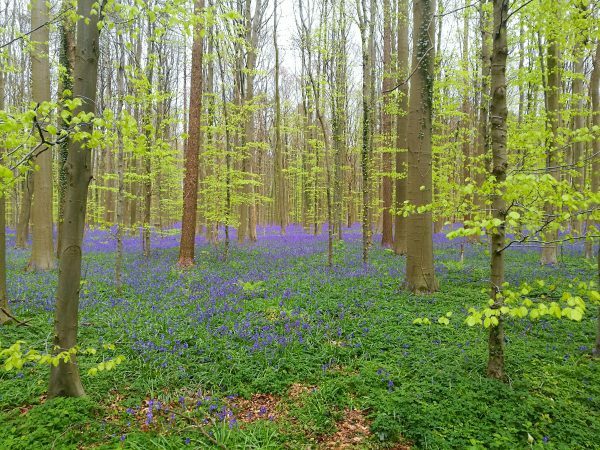 If you visit too early then the flowers will be too sparse, too late and the beech trees will have too many leaves, blocking the light, and the bluebells will be finishing. Obviously, if you are only going to be in the area for a week or something then you will have to take your chances. 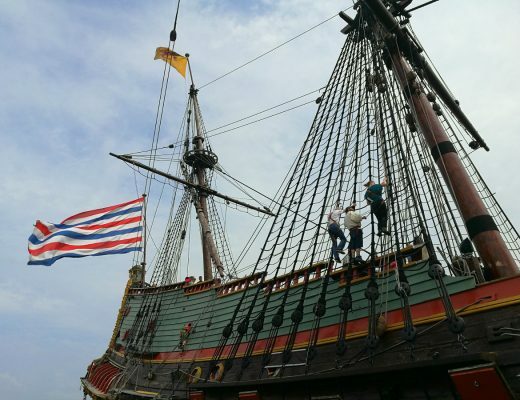 But if you are travelling for longer in Belgium or the Netherlands (or even France on the border to Belgium) then you can use this website to keep track of the best days to visit. 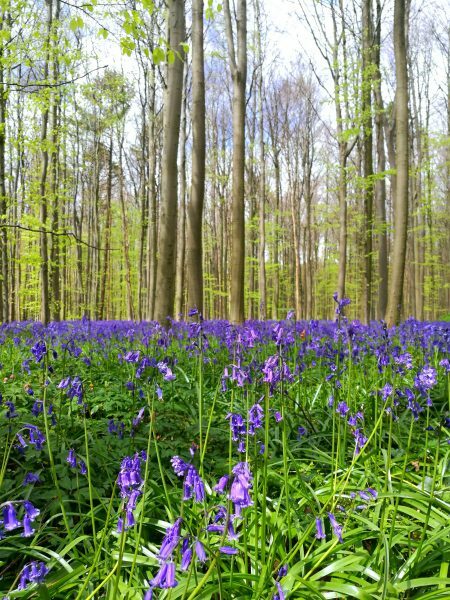 You may also want to try and time your visit for when the forest won’t be TOO busy, which is of course rather difficult during the bluebell bloom as a lot of people also want to see this! 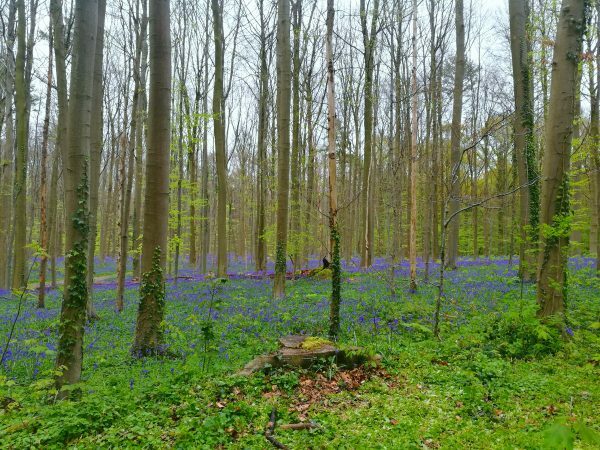 I stalked the above website for weeks before a public holiday in the Netherlands coincided with the website saying the bluebells were out in force. The weather on the day of our visit wasn’t great (overcast and some showers) but at least it didn’t rain while we were there. But I chose to go on a Friday when Dennis was off work so that we could avoid the weekend crowds and while the car-park seemed fairly busy for most of our time walking around in the forest we barely saw another soul! The time of day also plays a big part in how magical the forest will look, so if you are staying close enough to the area then arriving either very early in the morning (the hour after sunrise) or late in the afternoon (the hour before sunset) will give you the most beautiful views and photographs. As we were coming all the way from the Netherlands (and we kept getting stuck in traffic jams) this wasn’t really possible for us. Check out the first website I linked for some really breath-taking shots by professional photographers if you want to see how images of Hallerbos can look in the right conditions. 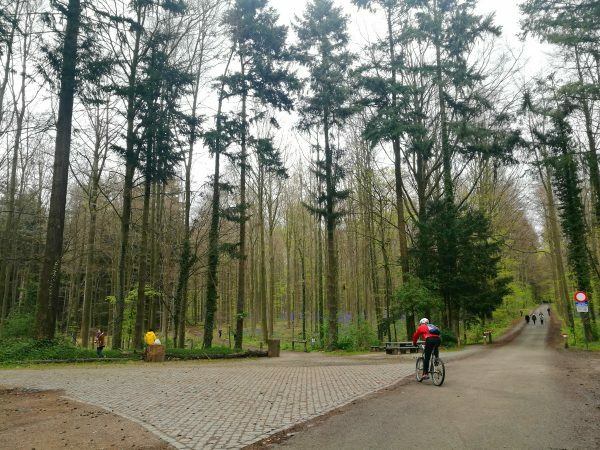 To visit Hallerbos you are going to need either your own car (or hire car) or to get a train to the town of Halle. 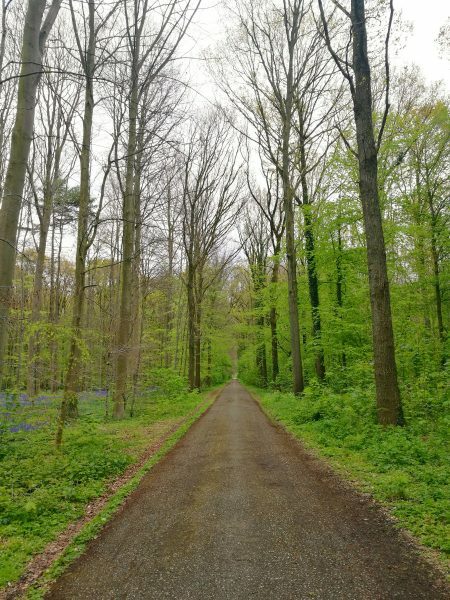 Hallerbos is located about 35 minutes out of Brussels by car, 55 mins from Antwerp or Ghent and about 2 hours 37 mins from Amsterdam depending on traffic. 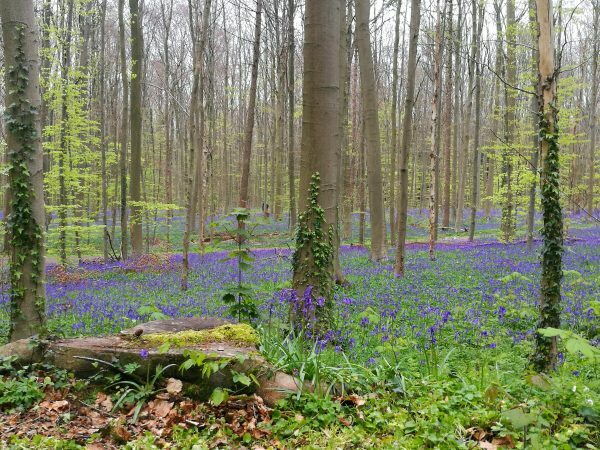 Apparently you can also get a free shuttle bus from Halle station on weekends (probably only when the bluebells are blooming), they run every 15 minutes or so. It only takes about ten minutes to get the train from Brussels to Halle, and it costs about 4 euros each way. The forest itself is very large and doesn’t have any shops or anything so if you are planning on spending a while then you will need to bring food and drink; but it’s the perfect spot for a picnic! You can also bring your bike and go for a ride or hire a bike from the Blue Bike hire place right next to the train station in Halle. There are also horse-riding only trails in the forest, but I’m not sure how you could arrange to go for a horse-ride; although I’m sure it would be lovely! 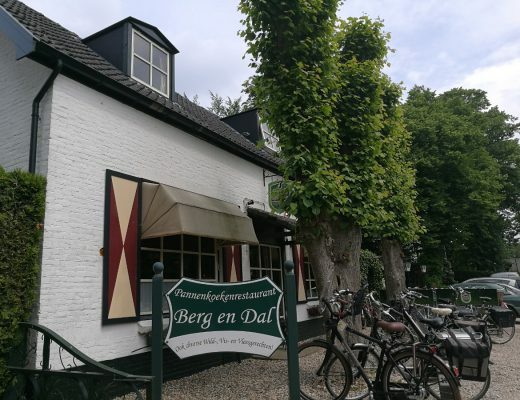 The official Hallerbos website has lots of information if you are looking to visit (as well as the flowering information) so definitely check it out for more details about visiting Hallerbos. There are a couple of different downloadable maps to help you with exploring the forest (as it is big) and where the different parking areas are. We parked at the P8 parking lot and I’m pretty sure we only saw a fraction of the forest on our walk. 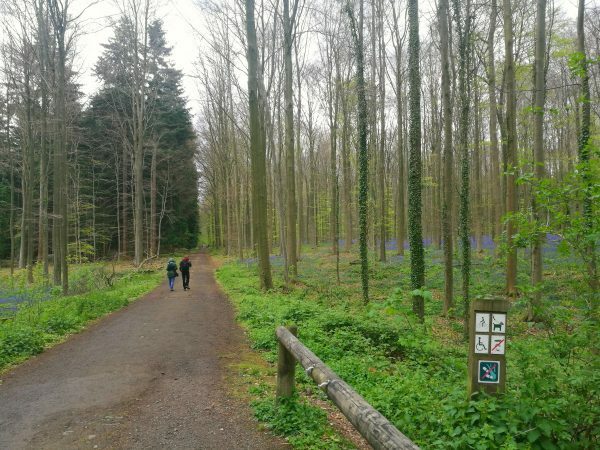 The paths are very easy to follow and not challenging, they also give great views of the bluebells, beech trees and all the other gorgeous flora and fauna in the forest! 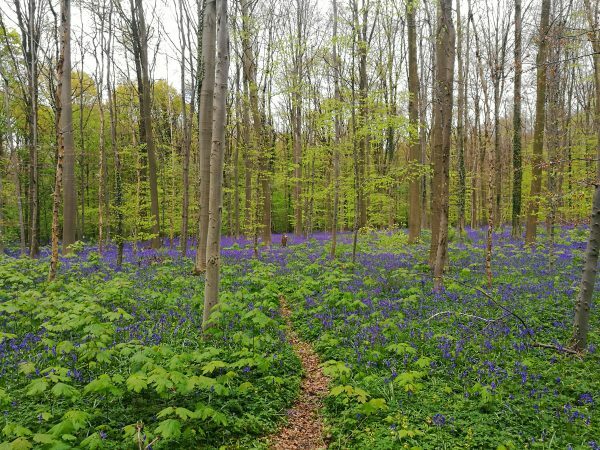 While Hallerbos is a beautiful spot and I absolutely recommend a trip if you are able (especially when the bluebells are in bloom) there are a few things to be aware of. 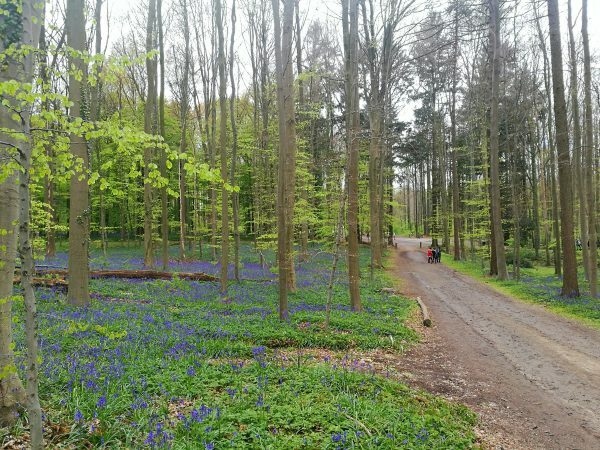 One of the things mentioned often on the official website is how important it is to stay ON the paths while walking through the forest, but unfortunately a lot of tourists seem to ignore this even though it is also signposted in the forest. Even if it looks like you are walking through a gap in the flowers or a path that someone else has made, apparently walking amongst the flowers can prevent flowers from growing there next year, even if you don’t think you’ve actually walked on any flowers. As much as photos of people (usually girls in flowing dresses) walking through beautiful flower fields are popular on Instagram, please don’t be one of those people that destroys the delicate plants for the sake of a pretty photo. 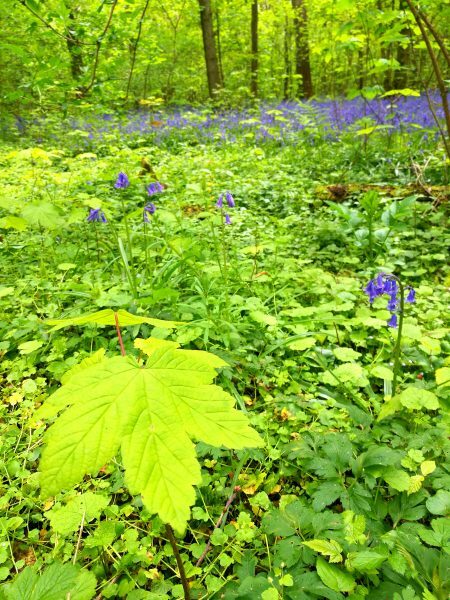 If you keep walking on the paths there are plenty of places where you can get close-up photos of the bluebells or seem like you are standing amongst them without actually having to destroy them while doing so. 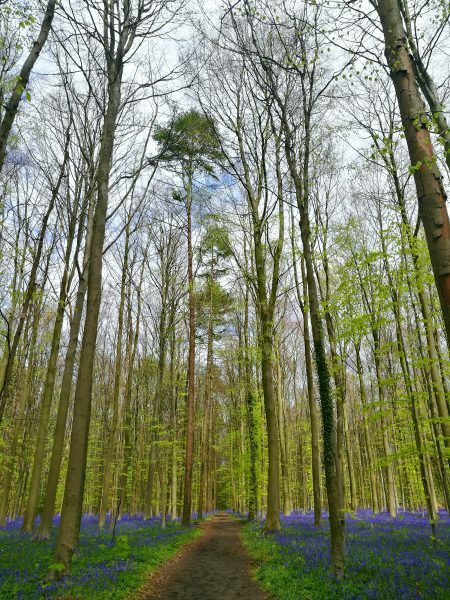 Professional photo-shoots or filming require bookings, drones are not permitted in the forest and you also shouldn’t touch or pick any of the bluebells either. Dogs are allowed as long as they are on a leash, and you know, make sure you clean up their poop so you don’t ruin someone else’s magical visit when they step in poop! Rules aside, this is definitely a very unique forest to visit, and make sure you have lots of memory on your camera as you will end up taking hundreds of photos, trust me. Every five metres I was stopping to take a new photo, exclaiming “Oh it’s so pretty!” to the exasperation of my long-suffering boyfriend! 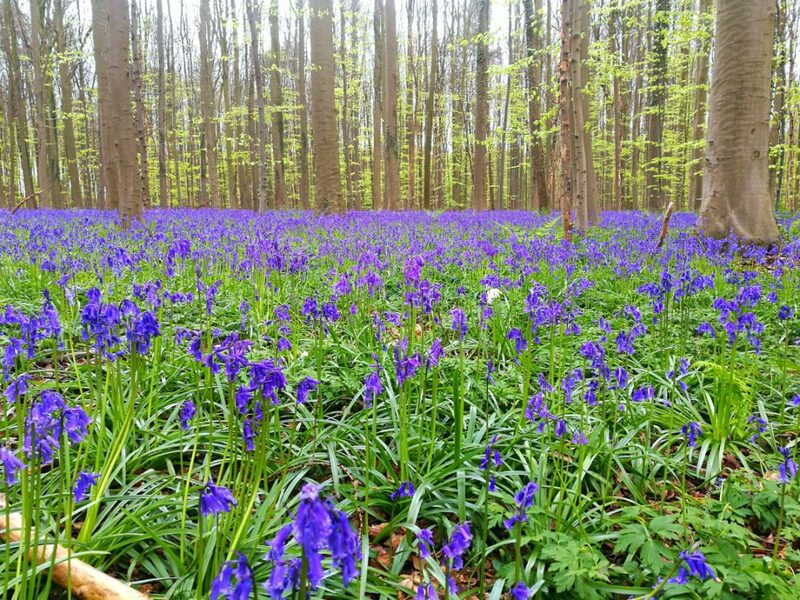 But if you follow these tips you will definitely be on your way to your very own walking through a fairy-tale forest experience. 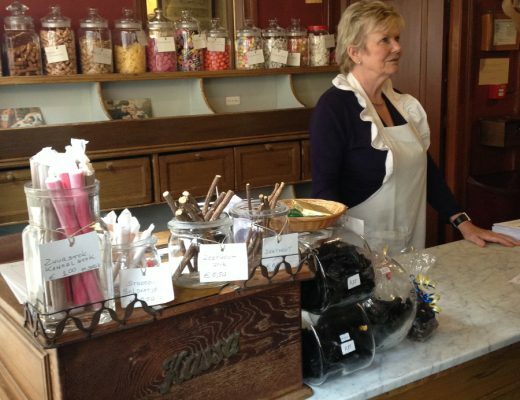 Have you ever been to Hallerbos? Share your tips in the comments below and don’t forget to pin this for later if you are planning to visit this fairy-tale destination in the future!